Italy's political landscape grew even shakier Sunday after the president refused to approve a proposed Cabinet minister with views critical of the euro currency and the premier-designate quit his bid to form a populist coalition government. 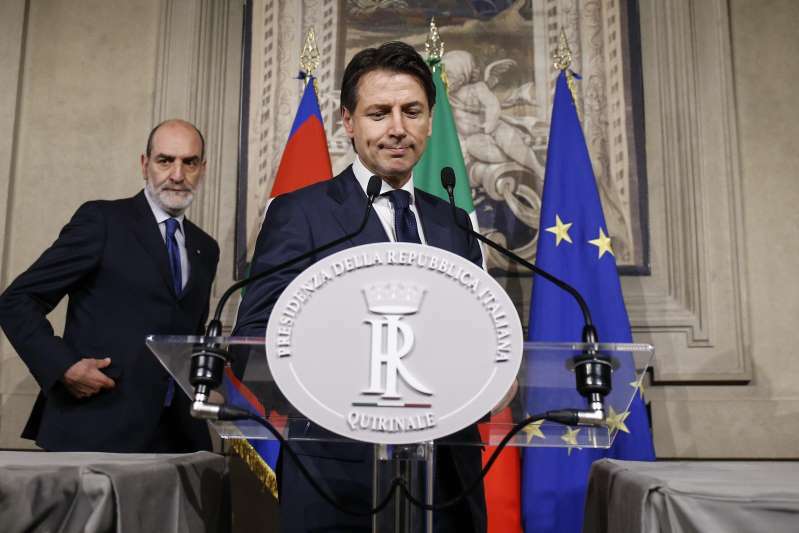 After being summoned to and emerging from the Quirinal presidential palace, Premiere-Designate Giuseppe Conte did not say why he couldn't form what would have been Western Europe's first populist government. But Italian President Sergio Mattarella told the nation minutes later he had refused to accept the nominee the euroskeptic League and 5-Star Movement parties had put forward as economy minister. League leader Matteo Salvini in recent days had virtually given an ultimatum over the economy minister pick to Mattarella, whose duties as head of state include sanctioning a new Cabinet. The president said he approved all of the other Cabinet picks, but rejected the coalition partners' choice for the economy portfolio out of concern it would have a negative effect on financial markets and the Italian economy. The economy ministry "always constitutes an immediate message of trust or alarm" for financial markets, Mattarella said, adding that he had asked for someone who was not "supporting a position expressed more than once that could probably, or in fact inevitably, provoke Italy's exit from the euro." Mattarella said he was considering political party leaders' request for another election and would announce his next move "in the next hours." The previous parliamentary election, held March 4, failed to produce a party with enough support to govern singlehandedly. League leader Salvini and fellow euroskeptic Luigi Di Maio of the 5-Star Movement agreed this month to join their rival forces in a coalition to break the political impasse. With neither of them willing to back the other as premier, however, they ended up tapping political novice Conte, a law professor at the University of Florence and a 5-Star supporter. A presidential palace official, Ugo Zampetti, told reporters Sunday night that Conte "has given back the mandate" Mattarella gave him four days earlier to try to form a government. While Conte held his final talks with the president, Salvini was telling right-wing supporters he had refused to submit to a presidential veto of his choice for economy minister, Paolo Savona. Anticipating Mattarella's decision, Salvini seethed. "We're not a free country," he said at a political rally. "We've got limited sovereignty." Earlier Sunday, an Italian economics-focused web site, scenarieconomici.it, carried a statement from Savona that appeared aimed at assuaging doubts about his commitment to the euro currency and the European Union's rules. "I want a different Europe, stronger but fairer," Savona was quoted as saying. Di Maio also scathingly criticized Mattarella's veto of Savona as "incomprehensible." Di Maio's Movement is the largest party in the new Parliament but remains far short of having an absolute majority. Italy's outgoing economy minister, Pier Carlo Padoan, said in a TV interview Sunday that the real problem isn't Savona, whom he described as having a good background for the post. Instead, what Padoan finds worrisome is the "clearly unsustainable" platform of a populist government "that doesn't rule out a Plan B: that is, in the face of European pressures, one must leave Europe."